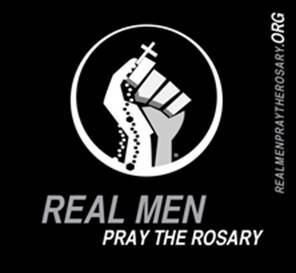 Today, Real Men Pray the Rosary and DynamicDeacon.com launch a countdown towards the start of a 33 day Rosary Challenge. RMPTR would like to encourage all Catholic faithful to pray the Rosary daily for 33 days. We all need a challenge and what better day to begin a challenge than with the help of our Blessed Mother. Please consider joining us in this worldwide prayer initiative. Today is 14 days till the start of the 33 day initiative, which will begin on August 29th. Praying the Rosary “provides genuine training in holiness.” Who wouldn’t want Mary as their spiritual trainer. Join us in praying the Rosary daily. Will you take the challenge? Invite someone you love.